Most people might not appreciate the comprehensive real estate marketing that REALTORs must do in order to sell a home. In fact, most probably assume that real estate marketing is about putting a sign in the ground and taking a few pictures to post with some fluffy words in the Tallahassee MLS. During the peak of the housing market, a sign with a telephone number was great real estate marketing. But not today. In a market where more than 1/2 of all listings go unsold during their first listing period, real estate marketing has become the skill that separates the professionals from the mere licensees. So let me share a little success story about how we sold a property using this real estate blog and a contest. A fellow real estate professional from out of town reached out to me to see if I could help his brother. This brother owned one of the nicest homes with acreage in the far reaches of Eastern Leon County, but he wanted to move closer to his family out West. But he could not have picked a tougher time to sell a home in Tallahassee. After performing a comprehensive sales and value analysis, I had to advise him it was likely that only two buyers would surface for a home like his over the 12 months after our meeting. Supply was high, demand was almost non-existent. So what could we do? I felt like the key was to create a buzz about his property that would spread across the internet, but with a focus around real estate professionals (the people likely to have a buyer who would like a nice home with acreage in Tallahassee). So we created a contest that would give away an iPad to the first person to guess the final sales price of the home. I knew we could draw more interest this way, but I was amazed at the numbers we generated. Before the home had even reached the market, we had more than 10,000 people view the real estate blog article, and 197 published "guesses" for the final home price. Additionally, the home listing online was viewed more than 3,000 times after the contest was underway. Finally, the home was shown more than 14 times and received four offers, all in just over 4 months. If there were ever a real estate marketing "success story," this has to be one for the books. I want to take the time to mention that the difference between the highest guess and the lowest one exceeded $1M, yet Tallahassee REALTOR Steve Wright hit the final price "spot-on." 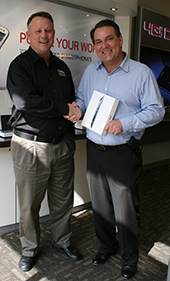 Steve and I met up on Wednesday to award him the iPad and I sure hope he enjoys using it as much as we do at our real estate office, it truly is a great tool. And though Steve and I work as competitors, I am proud to say that a "Pro" was the one who was able to forecast the final sales price. I once saw an NAR survey which showed that 64% of home sellers hired the first real estate agent they spoke with, and they claimed that they hired them based upon the fact that "they liked the agent." There was no mention of how they valued the real estate marketing plan. Yet we know that more than 50% of all listings fail to sell with that first listing agent during the initial listing period, so perhaps home sellers should brush up on the finer points on how to interview an agent for the job of selling a home. Please remember, you can follow this link that takes you to scores of articles about real estate marketing, or you can just drop me a note to schedule a time to discuss your home selling needs.